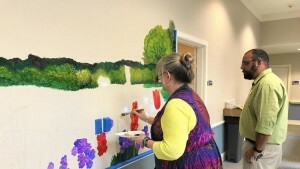 Berkeley Oaks was featured in The Virginia Gazette this weekend, showcasing the latest pilot program, a mural project for residents and staff. As part of Valeo, Latin for to thrive, the Create and Compose program, of which the mural project is a part, capitalizes on the therapeutic benefits that art and music offer. Residents, their families, and Berkeley Oaks staff joined artist and project leader, Colleen Koziara, to paint imagery based on one of Colonial Williamsburg’s tulip gardens. Read more about the mural’s purpose, Berkeley Oaks’ philosophy, and residents reactions here.